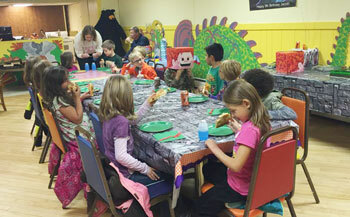 Birthday Parties are a Blast at Sandcastles Children's Museum! Sandcastles Children's Museum began in 2006 as a small "sampler museum" for children to explore. Since that time, the museum has moved locations and expanded to include three floors of interactive exhibits that encourage children and families to explore their world! The mission of Sandcastles Children's Museum is to offer hands-on discovery while stimulating creativity, curiosity, and the love of learning. $125 non-member/$100 member for use of the party room for 2 hours; $20 added for each additional hour reserved; enjoy the museum as long as you wish. $25 Cancellation Fee applies. $170 non-member/$145 member for use of the party room for 2 hours; $60 added for each additional hour reserved; enjoy the museum as long as you wish. $50 Cancellation Fee applies. The party space at Sandcastles is also available for meetings and parties without admissions to the museum. Fees start at $50 for members using the room during museum hours and reserving the space for 2 hours. Contact Sandcastles for a complete fee schedule and more details on meetings or small parties in the lower-level party room. 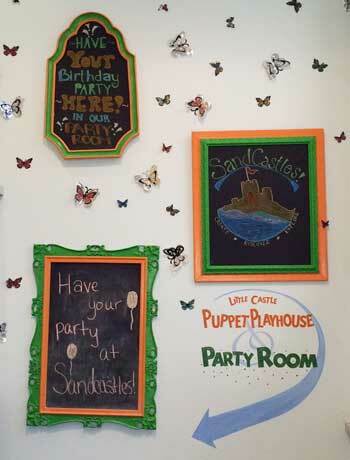 Parties and events at Sandcastles can be reserved by contacting Marcia, the party/events coordinator, at (231) 843-4363 with more information available by visiting Sandcastles' website at sandcastleschildrensmuseum.com. To learn more about the attractions at Sandcastles Children's Museum, visit our story here. Reunions in West Michigan...Fun for Everyone!